No matter how awesome you are at something, there will always be a trick or two to learn every so often. 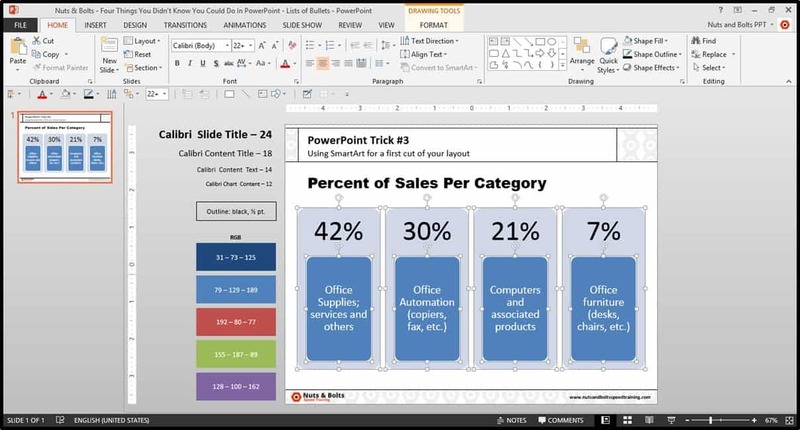 In this post, we’ve pulled out 4 things that we think most people don’t know they can do in PowerPoint. This trick allows you to pull ALL of the information out of a table (into their own individual text boxes)…WITHOUT retyping any of the text. 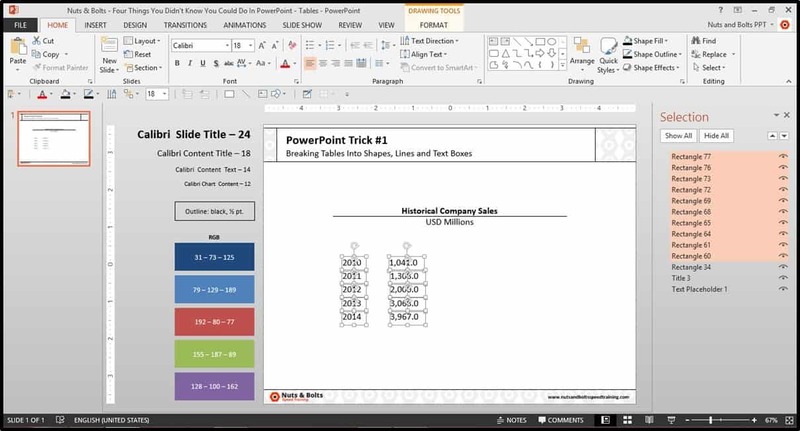 Select your table in PowerPoint (you can see the Table Tools tab in the Ribbon). And on your keyboard, either hit CTRL + C to copy the table, or hit CTRL + X to cut the table onto your clipboard. In the below picture, I have cut the table (so it looks like it has disappeared). 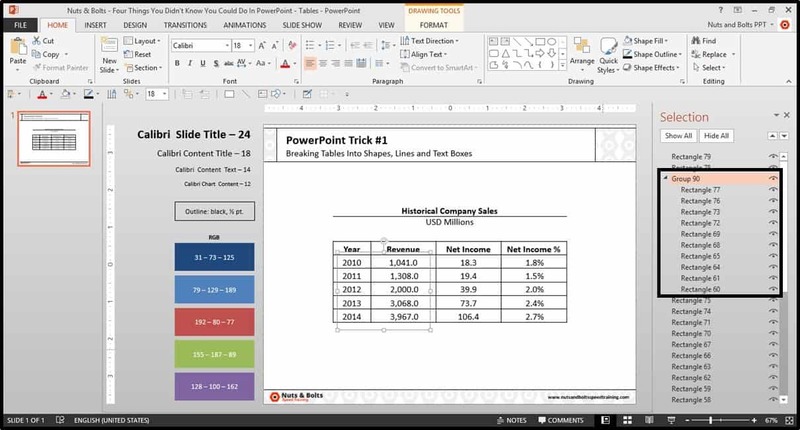 With the table copied or cut, you can either hit CTRL + ALT + V shortcut on your keyboard, or from the Home tab, click the small arrow below the paste command, and in the dropdown menu, select Paste Special, to open the Paste Special dialog box. 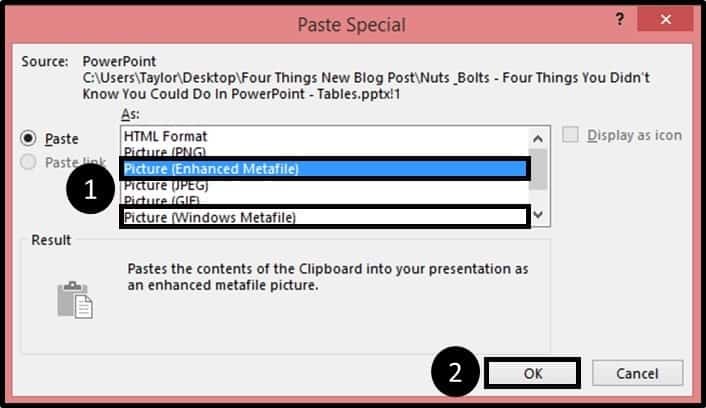 Within the Paste Special dialog box, either select the “Picture (Enhanced Metafile)” or the “Picture (Windows Metafile)” option to paste the table back onto your slide in the Metafile format. Clicking OK, you should have your table back as a picture. 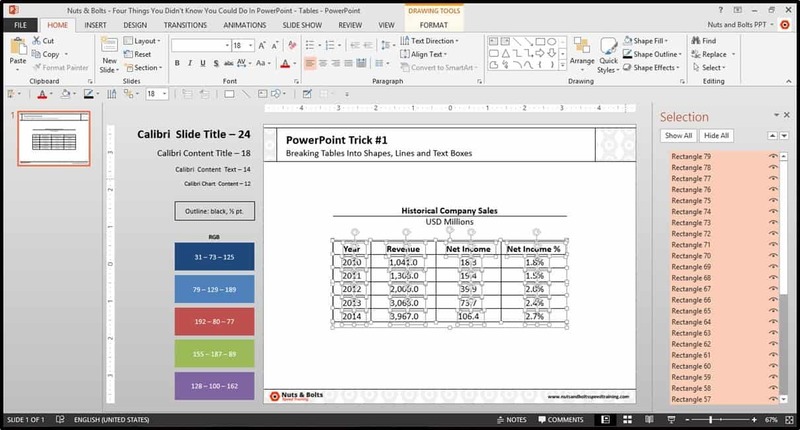 In the below image you can see the Picture Tools Format tab open. With the picture selected, hit the ungroup shortcut (CTRL + SHIFT + G) on your keyboard once, and in the dialog box that opens (this is an imported picture, not a group. 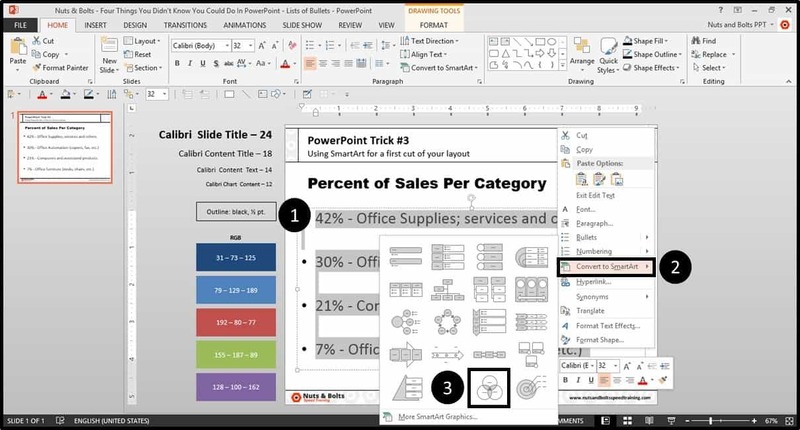 Do you want to convert it to a Microsoft Office drawing object? ), select Yes. 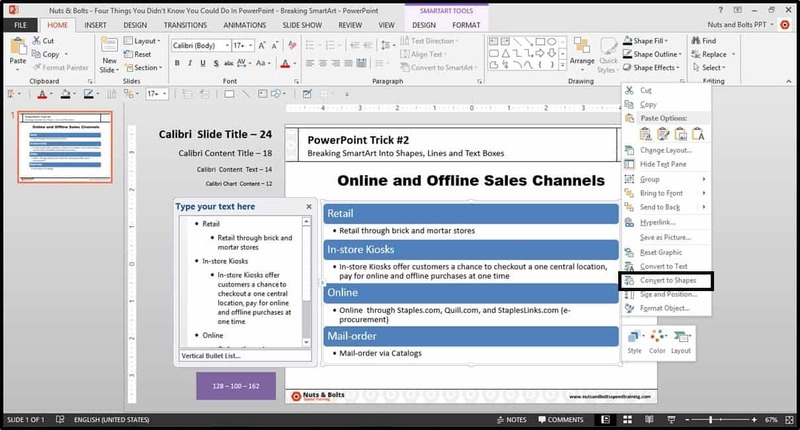 With the dialog box closed, hit the ungroup shortcuts again on your keyboard (CTRL + SHIFT + G) and your table breaks down into shapes, lines and text boxes that you can arrange and format into any layout you want. 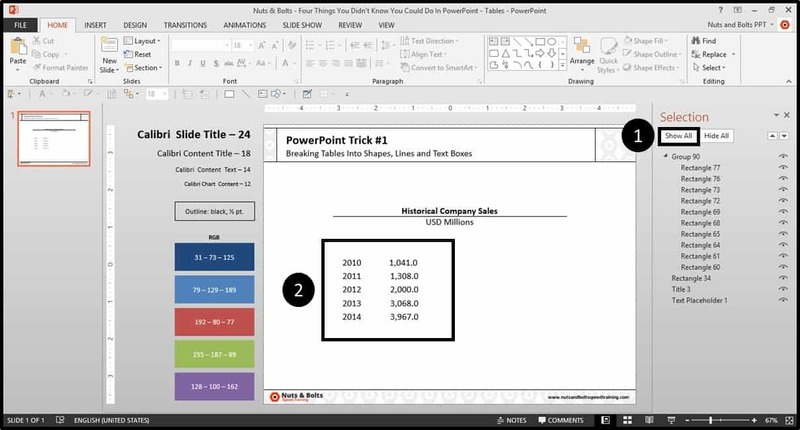 Here is an example of a final slide built using the individual pieces of the table (see the Optional Steps tutorial below for using the Selection Pane to manage your slide layout). From the Home tab, select the Arrange Tool dropdown, and at the bottom select the Selection Pane. You could alternatively hit ALT + F10 on your keyboard to open the Selection Pane. 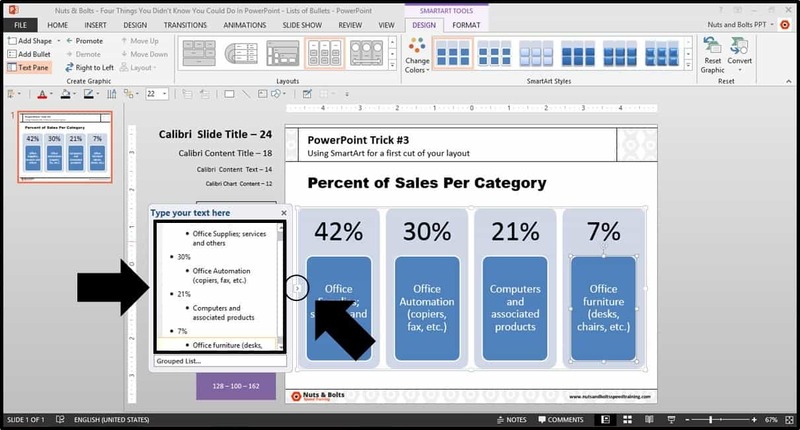 All of the highlighted pieces in the Selection Pane represent the different objects that you have selected within your slide. Hitting Escape, you will unselect all the objects. 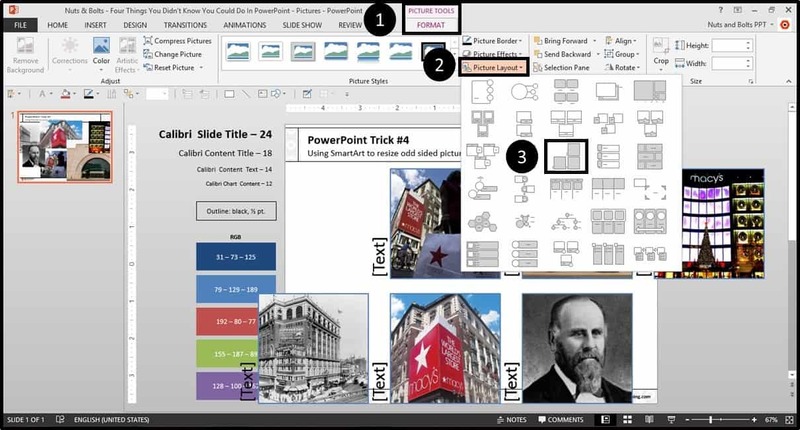 Then, holding Shift, select the objects within your slide layout that you want to keep. Notice that as you select the individual objects, they become highlighted in the Selection Pane. With the objects that you want to keep selected, hit CTRL + G on your keyboard to group those objects and notice that those objects are then also grouped in the Selection Pane (90 objects in this case). Within the Selection Pane, click the eye icon to the right of the group of objects that you want to keep in order to hide them. 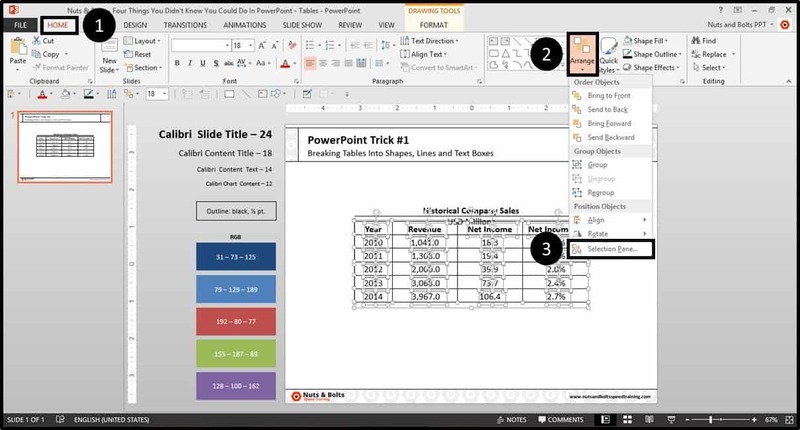 Click and drag with your mouse to select all of the other objects your slide (because the other objects are hidden, there is NO WAY to accidentally select them). With all of the objects selected, hit Delete on your keyboard to remove everything you don’t want from your layout. 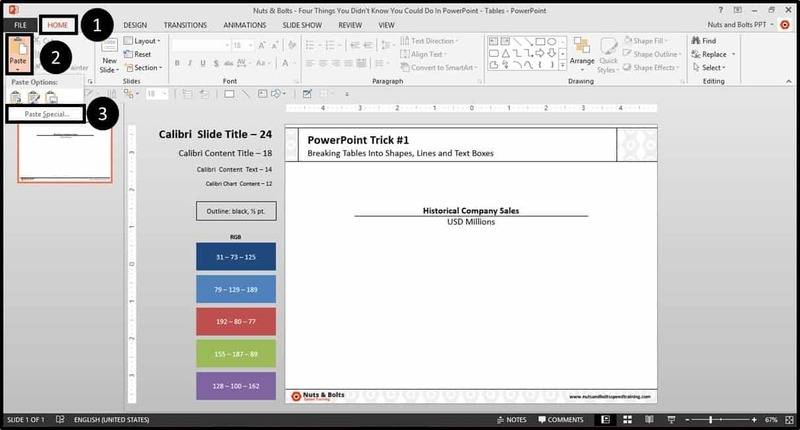 Notice how the Selection Pane simplifies down into just the slide titles and the hidden group. 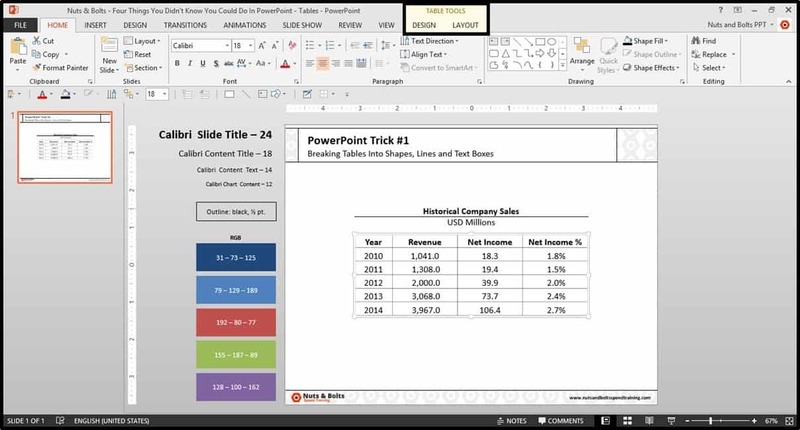 Within the Selection Pane, hit Show All to bring all of your objects back onto your slide. With your PowerPoint objects once again visible on your slide, you can then hit CTRL + SHIFT + G on your keyboard to ungroup them and then format them any way you like. 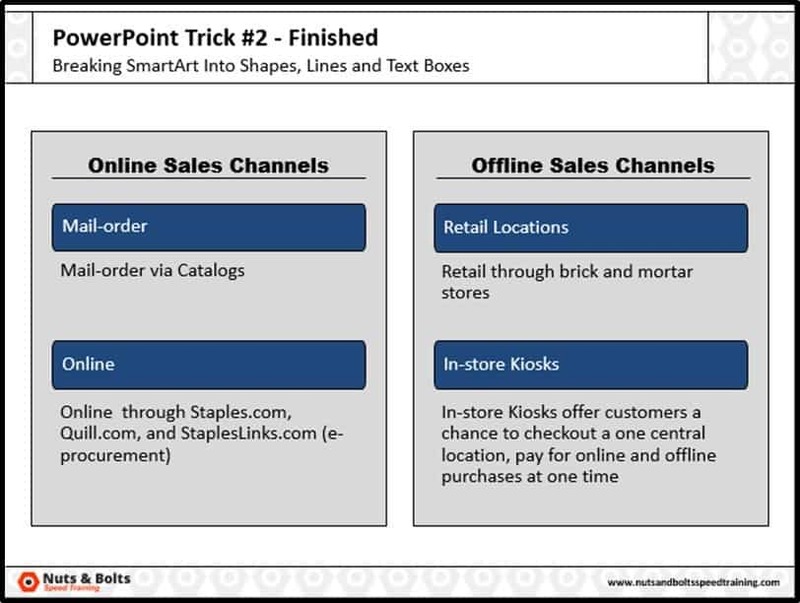 Select the SmartArt graphic that you want to break apart (you’ll know it’s a SmartArt graphic if the SmartArt Tools tab appears in your ribbon). Option #1: From the SmatArt Tools Design tab, you can select the Convert command and select Convert to Shapes. From here, you will need to ungroup the resulting graphic, so hit CTLR + SHIFT + G on your keyboard. 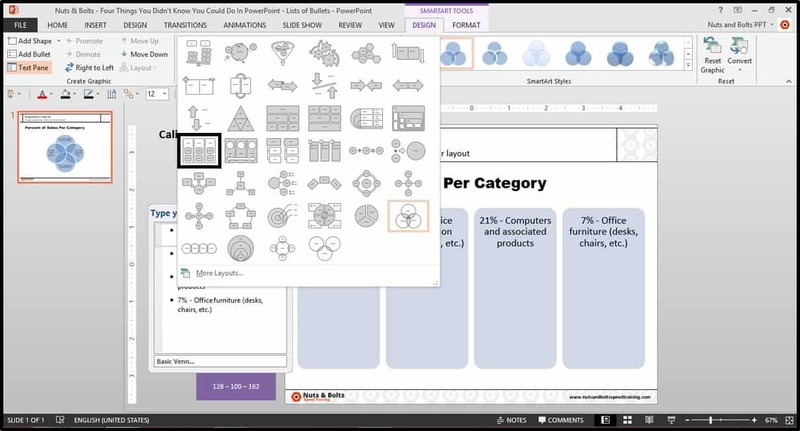 Option #2: Right-click your SmartArt graphic and in the right-click menu, select Convert to Shapes. Once the graphic is converted to shapes, you will need to ungroup the graphic, so on your keyboard hit CTRL + SHIFT + G for ungroup. Option #3: On your keyboard, hit CTRL + SHIFT + G for ungroup twice: the first ungroup will break the SmartArt graphic into shapes (the same as the above steps) and the second ungroup will ungroup the shapes into normal objects you can work with. With the SmartArt graphic now just normal shapes, lines and text boxes (depending on the SmartArt graphic you were using), you can rearrange and format the shapes however you see fit. 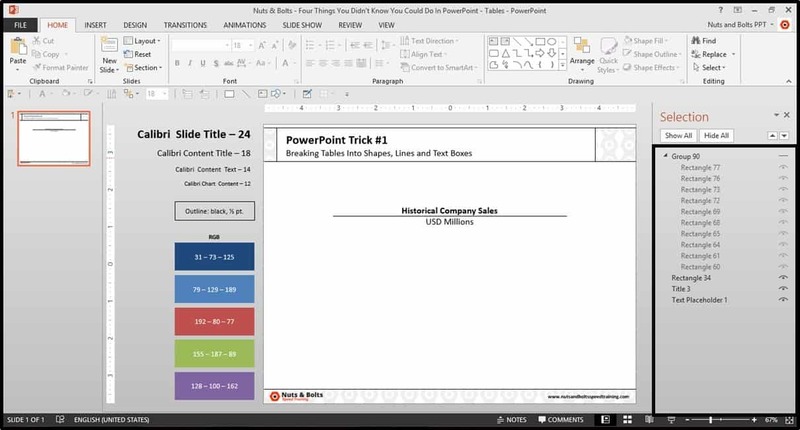 On your slide, select the list of bullet points that you want to breaking into shapes, lines and text boxes. Option #1: From the Home tab, select the Convert to SmartArt dropdown and pick a SmartArt category to work with. You can pick anything you like, but my recommendation is to look for something inspiring for your slide layout. 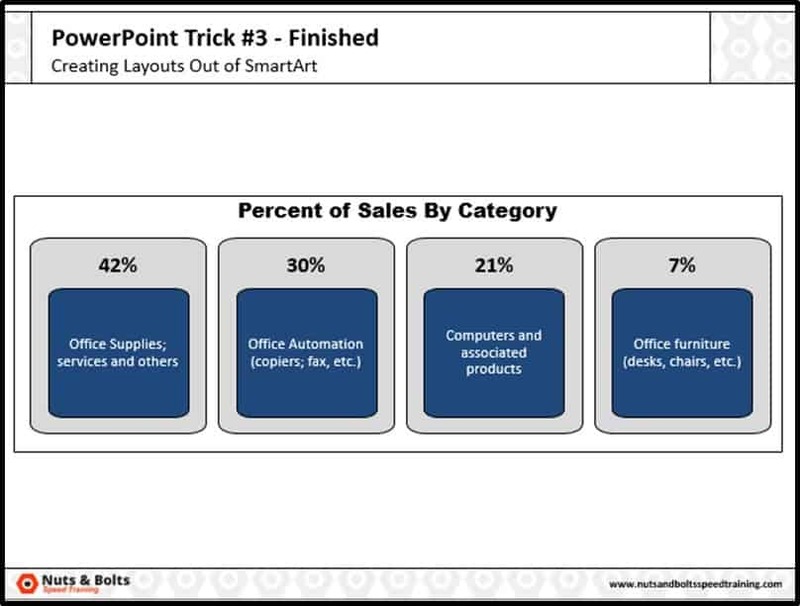 Option #2: Select the text within your text box or shape, right-click with your mouse, from the right-click menu select Convert to SmartArt and again pick a SmartArt category (I will again select the Venn diagram category). To break out the middle piece of a Venn diagram, see our other on how to break out the center piece of a Venn diagram. With a SmartArt category selected, you can see additional options for that category. From the SmartArt Tools Design Tab, select the galley dropdown arrow. Within the dropdown, you can now select a different SmartArt graphic within this category. I will select the grouped list. Depending on the graphic you select, you might need to rework your text within the box that opens up to the left of your graphic (if you don’t see this text box, hit the little arrow). With your text properly set to your SmartArt graphic, you can then break the graphic as demonstrated in PowerPoint Trick #2. I will just hit the ungroup shortcut, CTRL + SHIFT + G, twice to ungroup the graphic into shapes, lines and text boxes. 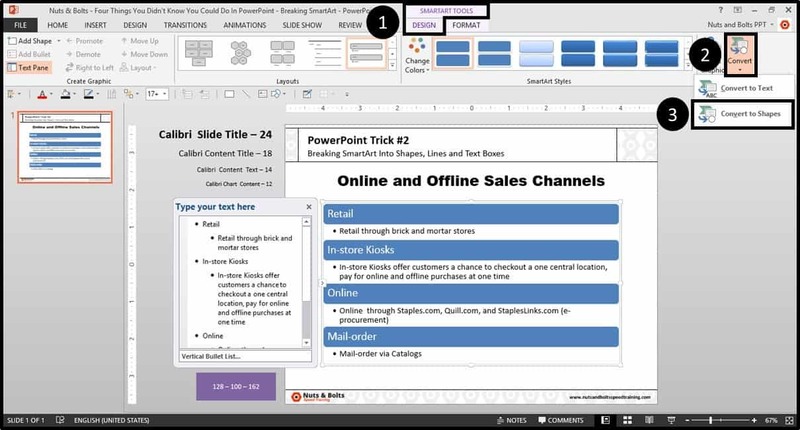 With your layout in shapes, lines and text boxes, you can then format and arrange the resulting pieces any way you see fit. 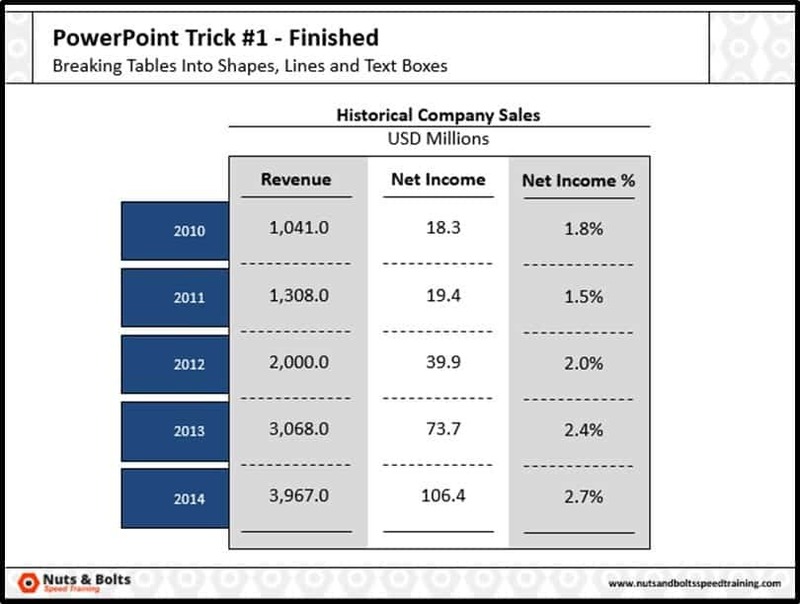 This picture trick is great for consultants, investment bankers and other professionals who frequently have to resize and crop multiple pictures to create more visual layouts. This trick does not always work (see below), but it is significantly faster than cropping and resizing your pictures manually. 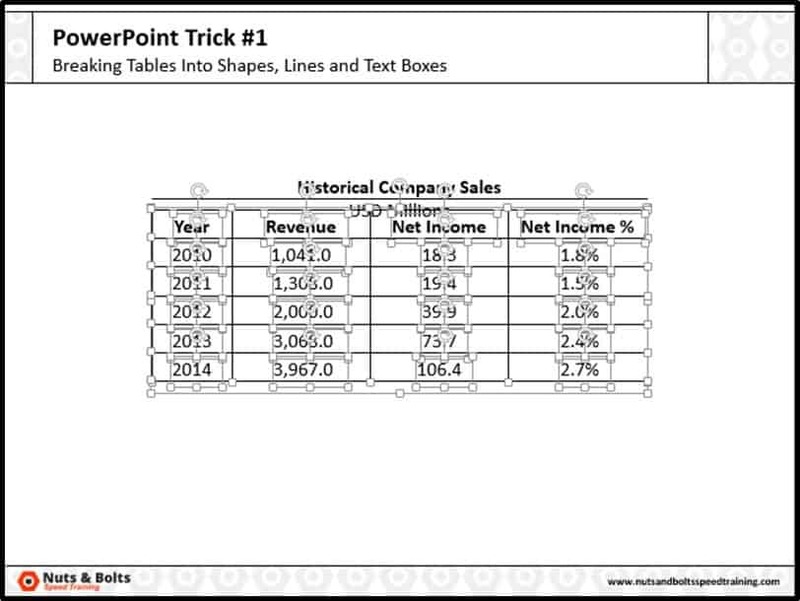 As such, I always start with this resizing trick first to see if it works for my presentation. 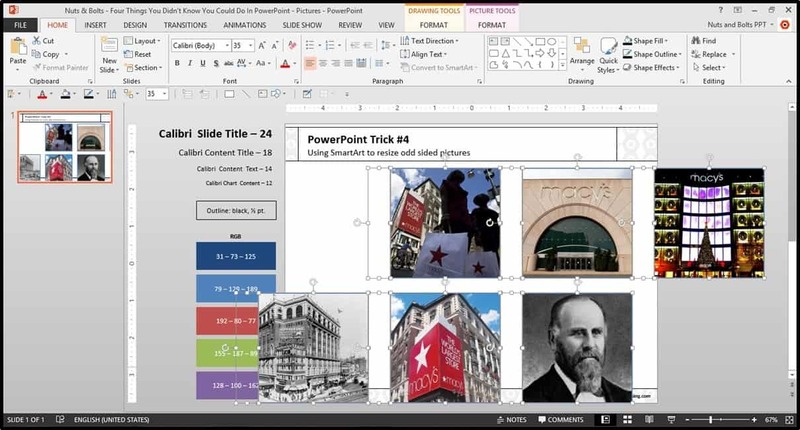 Within PowerPoint, select all of the pictures that you want to resize and crop. 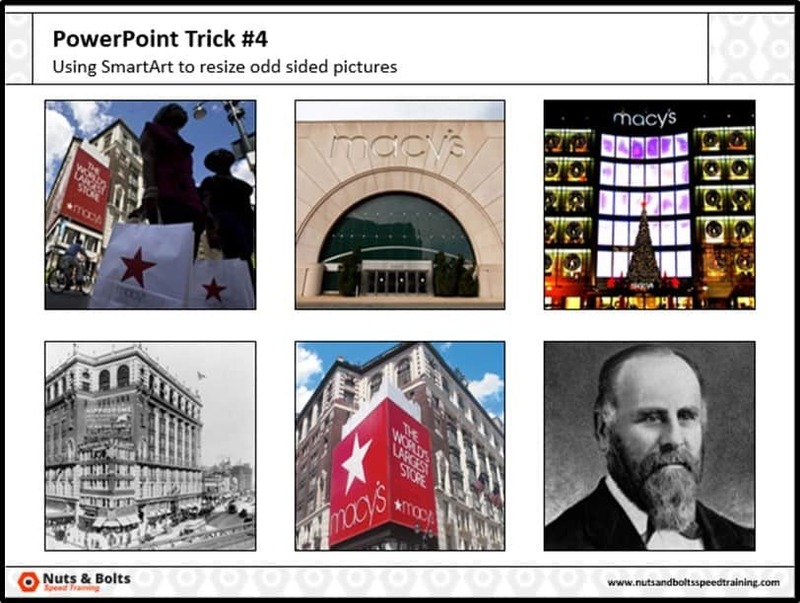 In this example, I’m using a variety of pictures from a Macy’s corporate presentation, and you can see that they are all different heights and widths. 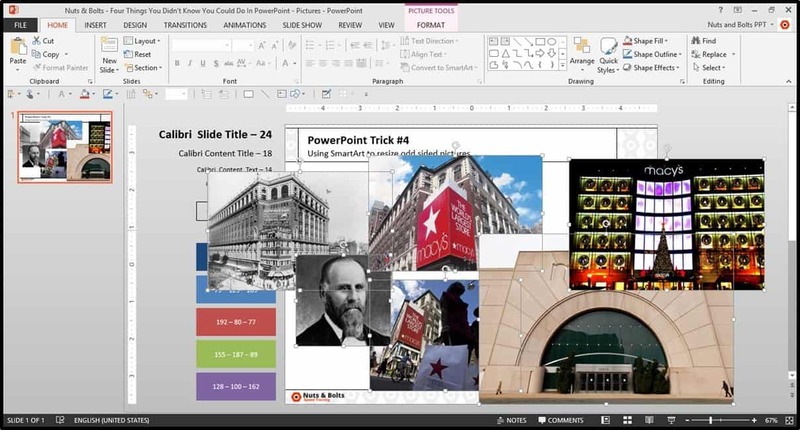 With the pictures selected, from the Picture Tools Format tab, navigate to the Picture Layout command, and pick a graphic that gets the pictures the closest to what you are looking for…which forces your pictures into that set layout (which is really cool!). In this case I chose the Picture Accents Block graphic. 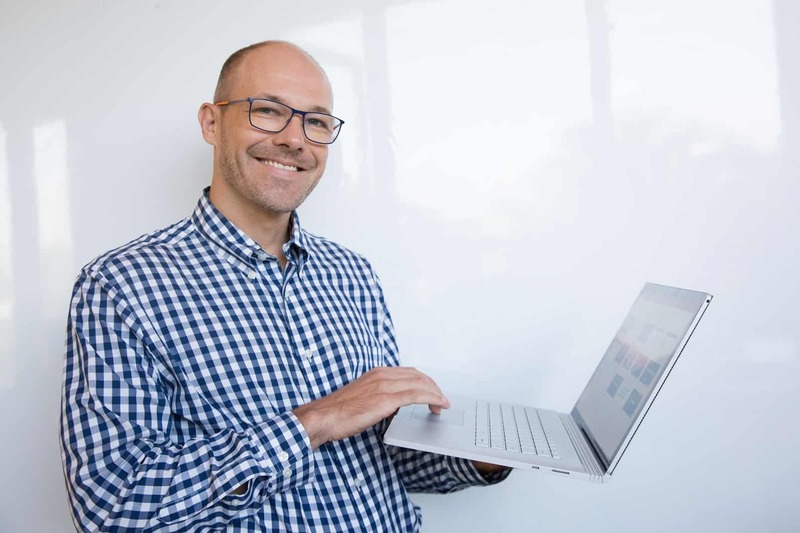 With the picture cropped and resized, select the graphic (you might need to click the outer edge of the graphic again for this to work) and on your keyboard hit CTRL + SHIFT + G for ungroup twice. Ungroup once, ungroup and a second time, and everything breaks down into shapes and text boxes. Holding Shift, unselect the pictures that you want to keep, so that only the empty titles are selected, and then hit Delete (leaving you with just your pictures). From here you can format and arrange your pictures into any arrangement you see fit. Here I’ve just stacked them on top of each other with a half point weight black border. 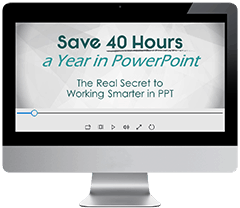 Have other useful PowerPoint tricks that you feel most people don’t know about PowerPoint that can help us all make it to Happy Hour? Let us know in the comments below. 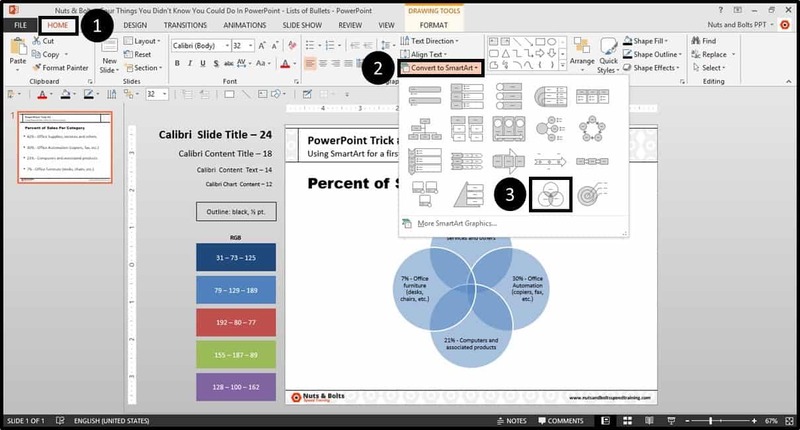 You might also like our post on creating your own text shortcuts in PowerPoint.